Juanita M. Crook, MD, FRCPC did her medical training at the University of Toronto, Residency in Radiation Oncology at the Princess Margaret Hospital and is currently a Professor of Radiation Oncology at the University of British Columbia. She is a staff Radiation Oncologist at the Center for the Southern Interior in Kelowna BC where she has developed image-guided HDR gynecologic brachytherapy, US-planned HDR prostate brachytherapy and permanent seed brachytherapy for breast cancer. 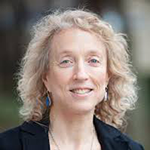 Previously a Professor of Radiation Oncology at the University of Toronto/University Health Network and Associate Professor at the University of Ottawa, she has particular interest in intermittent androgen suppression, post radiation prostate biopsies and penile brachytherapy. She has written 24 book chapters, over 200 journal articles and is a frequent speaker at international meetings, in English, French and Spanish. She was Scientific Chair of the 2007 American Brachytherapy Society meeting and frequently teaches at the ABS Prostate Brachytherapy School, which she is chairing and organizing this year. She is former president of the Board of the American Brachytherapy Society and recipient of the Thom Shanahan Distinguished Brachytherapy Educator Award. Juanita M. Crook, MD, FRCPC, reviews the radiobiologic rationale for high-dose-rate brachytherapy (HDR BT), its technical advantages, the evolution of HDR fractionation, and recent toxicity reports for both HDR BT boost and HDR BT monotherapy according to prescribed dose and fractionation. Does Radiation Therapy Favor Radical Prostatectomy in Long-Term QOL? 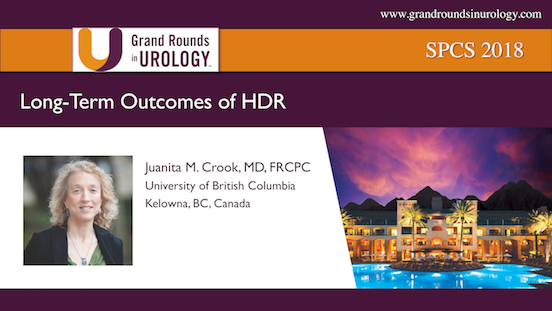 Juanita M. Crook, MD, FRCPC, discusses the challenges of assessing modalities for the management of high-risk prostate cancer in terms of quality of life (QOL) outcomes. She then reviews QOL data from the ProtecT trial, the efficacy and toxicity of presented for ASCENDE-RT trial, and data from two large, mature prospective databases. She also shares her opinion on the “tri-modality” approach. Juanita M. Crook, MD, FRCPC, argues that focal brachytherapy is one of the most effective and least invasive treatments for prostate cancer. She discusses patient selection for focal therapy, technical limitations, efficacy data, and best practices in post-focal-therapy monitoring.